Are you looking for party accessories to make your next special event or celebration five-star? Create a custom paper banner and use your own photos and personalized text to not only make a statement, but impress your guests as well. Our paper banners are perfect for birthday bashes, graduation parties, new baby announcements and much, much more. Printed on a heavyweight matte paper, they are sure to add a professional and elegant flair to your next indoor event, no matter the occasion. If you are looking for a customized banner for outdoor use, check out our grommet vinyl banner which is available in multiple styles and layouts perfect for any party or celebration. Once you have decided on the photos for your banner, simply upload them into your Mailpix photo folder. You can also add your Instagram and Facebook photos by using our built-in social media connection. Choose your banner’s size and orientation and then select the background style that best compliments your upcoming event. After your banner appears in the project builder, add your own photos and text to give your banner a truly customized look. Finally, review your banner layout and then place your order. Once you receive your banner, simply pin it up on the wall and let the good times roll. Your party guests will be impressed with your banner’s personalized look which will add a stylish and unique flair to any event from birthdays to homecoming parties. With our wide range of banner templates, you can build a banner for any occasion. Maybe you are throwing a birthday bash for someone special or a sports game party for your closest friends. Choose from one of our various background templates and add a special touch to your next party or special event. Our banners are also perfect for events celebrating a personal milestone. Create a banner for your son or daughter’s graduation party and include a favorite picture to liven up the celebration. Additionally, we offer baby announcement, homecoming, bon voyage and anniversary banners. Choose one perfect for your upcoming party or select our fully customizable style which will allow you to build a banner from scratch that is specific to your distinctive celebration. With so many options to choose from, you can create a banner that will add a special touch to any event, no matter the occasion. Create graduation banners with photos and text to liven up your grad’s celebration. Our paper party banners can be fully customized with their senior portrait and best moments from their final year of high school. Add text, choose backgrounds colors, or upload your artwork to make it truly unique! Our photo personalized graduation banners make the perfect graduation decoration that you can design yourself! If you are planning a birthday party for a loved one, make their party extra special with a custom photo birthday banner. Choose from our multiple birthday themed banner templates or start from scratch by using our fully customizable banner style. With this option, you can fully personalize the banner you create by designing your own custom photo layout, background and text to make it both elegant and unique. Additionally, our custom banner maker will allow you to carefully choose any color you wish for your banner’s background. Match the banner with your party accessories or choose your loved one’s favorite color to compliment their style and personality on their special day. To make your party even more exceptional, you can even create your own custom placemats and coasters from our kitchen and dining collection to go with your personalized banner and complete the look you are going for. Make it a birthday celebration they won’t soon forget! Show how impressed you are with your loved one’s accomplishment by creating a custom photo banner for their congratulatory event. Our photo banners, along with our creative graduation gifts, are perfect for high school or college graduation parties. Include your grad’s favorite photos on the custom banner to make their celebration all the more special. For a job promotion party, hang a customized banner complete with a series of photos to make coworker feel special for their accomplishments. Using our online custom banner maker, you can design a banner that is tailored to the style and personality of any planned party. Whether it’s a boy or a girl, you can design a custom photo banner that celebrates the birth of your new baby. Add your little one’s first photo to the banner and your own custom text for display in the family room. Throw a party and invite your friends and family to celebrate your new baby and shower your newest family member with one of our various gifts for new babies, including our popular baby blankets. A baby announcement banner is sure to add a splash of color and elegance to your new baby celebration. Choose one of our baby themed templates, or create your very own with a fully customized color and photo layout. Using our project editor, you can design a baby banner that is perfect for welcoming your newest family member into the world. In addition to new baby announcements, graduations and birthdays, our personalized banners can be made for any occasion. Maybe a loved one is finally returning home after a long time being away from friends and family. Create a stunning banner that reads “Welcome Back” and surprise them with a party accessory that makes their return home both heartwarming and unforgettable. Perhaps, you are planning an event such as a bridal shower, a formal ball or a vacation send-off. With our customized text feature, you can add text that is specifically tailored to any event, both casual and formal. 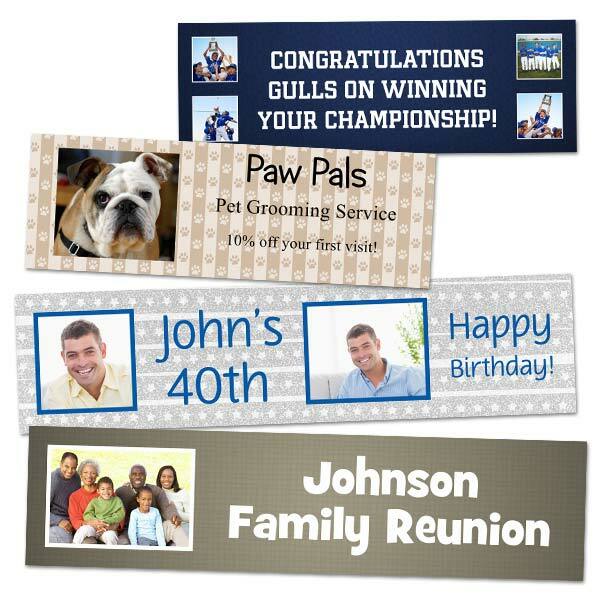 From sports banners to bon voyage banners, our multiple customizable options got you covered. Do you have an upcoming business event and need a banner to advertise your product or services? Perhaps you are setting up a booth at a business convention and you want to draw in patrons to make your sales pitch more successful. Create a custom banner to pin-up at your business or at a trade show to advertise your services using your own text and photos. Adding a customized look to your business venue will impress your clients and attract more future business prospects. For outdoor advertising, check out our stand up banners which will allow you to conveniently showcase your business from the street without the worry of weather damaging your promotional display. Add a personalized touch to any upcoming celebration by showing off a favorite photo on a personalized banner announcement. At Mailpix, you can easily create a banner online that compliments any event from birthday bashes and bridal showers to business advertisements and graduation parties. Use our custom banner printing options to choose the perfect background pattern and photo layout to impress your guests and give your celebration a truly unique flair. 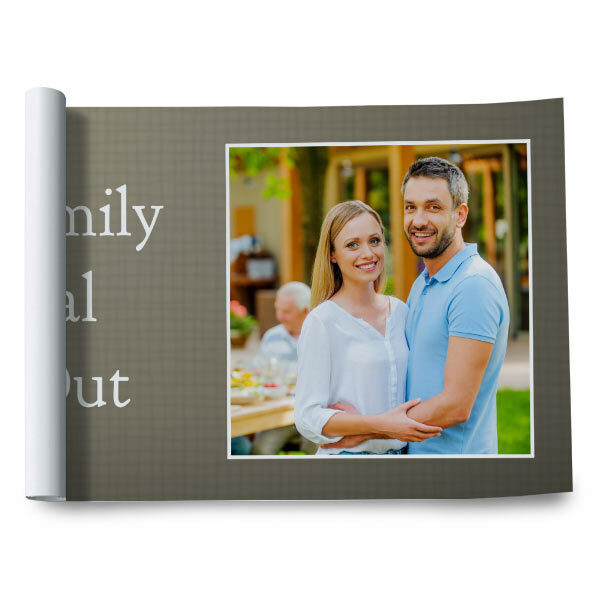 Whether it’s promoting your business or welcoming home a relative from a long vacation, our paper photo banners are perfect for any occasion.